The Jack Loney Award is presented for dedication and excellence in Maritime Archaeology. Jack Loney was an inaugural and long-standing member of the Victorian Governments Historic Shipwrecks Advisory Committee (HSAC); the Victorian government decreed a perpetual memorial award – called the Jack Loney Award – for outstanding contribution to maritime history in recognition of Loney’s contribution to the preservation of Australia’s shipwreck and maritime heritage. 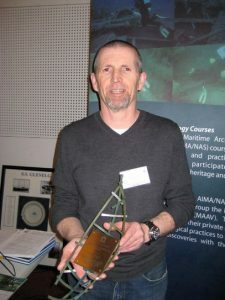 The Award is made only as occasion demands, with the recipient chosen by the Victorian Historic Shipwrecks Advisory Committee to the Heritage Council. PT a truly deserving and popular winner has spent many years researching shipwrecks, not only for himself but also unselfishly to assist others as well. Presenting the Jack Loney Award, Planning Minister Justin Madden said Peter Taylor had been a prolific shipwreck finder. “Peter’s passion for shipwrecks and maritime history was ignited during his first shipwreck dive in 1978,” Mr Madden said. “Peter Taylor has all the outstanding qualities commemorated by the award, mirroring many of Jack Loney’s achievements,” Mr Madden said.